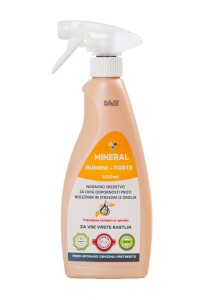 MINERAL YELLOW FORTE is a natural agent for increasing plant resistance against diseases and environmental stresses. Spraying all types of plants with 8 % solution (approx. 80 ml/1 l of water), at least 2 to 3 times each other day. We begin at occurrence of first signs of diseases or damages due to environmental impacts. WARNING: Use of MINERAL RED FORTE and MINERAL YELLOW FORTE must be at least 48 hours apart. Especially in organic and hobby gardening, it can limit diseases to the extent that no significant damage occurs on plants and crops. In particular, it limits development of ash moulds, pit, grey moulds etc. Following the instructions, it is an efficient help in cases when use of fungicides is not desired, possible or allowed. 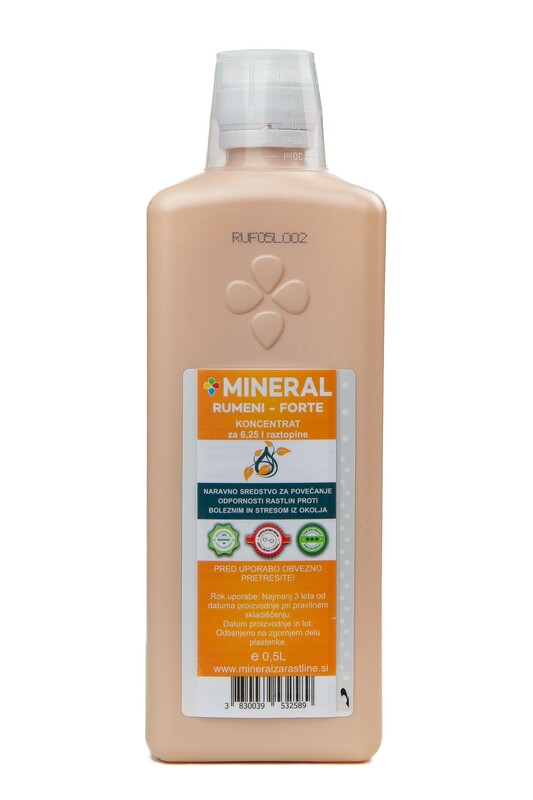 At the same time, it significantly lowers the used quantity of fungicides when they are used. It works in all above ground parts of plants. It penetrates the plant within 30 minutes through epidermis of leaves and other above ground parts. Several repetitions in a shorter period limit development of diseases and damages due to the adverse environmental impacts (especially in gardens located near houses and in organic production).